I am reading three books right now. 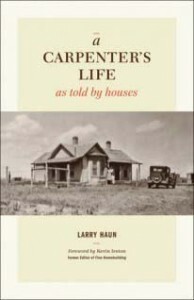 The first is Larry Haun’s memoir “A Carpenter’s Life — as told by houses”, published by The Taunton Press. It covers the arc of his life through the houses he lived in and houses he built during a lifetime as a carpenter. Haun would probably come in third behind Joseph of Nazareth and Tom Silva of “This Old House” if people were asked to name their favorite carpenter. He is especially well known in my personal circles as the guy who wrote the standard in the field for Habitat for Humanity on building houses. His book is a very personal memoir with a great deal of his own philosophy of life incorporated into it. I particularly like his ideas on efficiency in construction and how to speed up the process of building a house. On the other hand, I found a bit of a disconnect between his life in building large numbers of tract homes and his ideas on saving the environment. I do enjoy his homespun style and I have used his books on construction for many years. Haun passed away last year. The second book I am reading is from Lost Art Press, Chris Schwarz’ delightful new specialty publishing company. 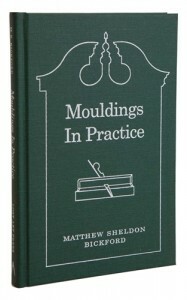 “Mouldings in Practice” is written by Matthew Sheldon Bickford, he of the popular blog “Musings from Big Pink.” The book is fascinating and is not as much about tools and hand work as it is about freeing up your mind and your work. The author starts out by pointing out that most of us either buy mouldings ready made or by finding a router bit at the store that matches the shape we need and running our stock through the router table. When we do either of these things, we are severely limited in the shapes we can make or use. And if you want to change a profile you have to go back to the store and buy another bit or find another profile. With just a few moulding planes, you can make a virtually unlimited number of shapes and match any shape you see. Subtle changes in shapes and profiles are easily accomplished. Didn’t you ever wonder how they used to do it before electricity and hand held routers? I know I did. I couldn’t help but laugh when someone suggested that the initial reaction to this book by most people is “Oh crap, now I want to buy those stupid planes.” It is so obvious and so simple and so flexible that anybody above beginning woodworker will look at this and jump on it. This book is highly recommended, not just for the woodworking but for the new approach to your woodworking life. The third book has nothing to do with woodworking, but since I am scheduled for a class at John Campbell Folk School on split bamboo fly rod making, I wanted to re-read “A River Runs Through It” by Norman Maclean, the essential classic on fly fishing. Many people have seen the movie made from the book a few years back, but as is often the case, the movie cannot provide a full appreciation of the skill of the author. Whatever writing skill I have was gained by practice and by reading, and I am not sure that writing can be learned anyway. As the old saying goes, “Either you got it or you ain’t”. This guy had all the skills and when you sit and read a sentence over and over and ponder the injustice of why he can do that and you can’t, then you appreciate real genius. I will offer some insights on bamboo fly rod making and the John C. Campbell Folk School in North Carolina in a few days. Winter is coming. Better get these books so you will have something to read when the nights get cold and long.